Garage Equipment Online stocks the Crypton class 4 ATL Scissor Lift MOT Bay, this ATL package is designed for one man testing of all class 4 vehicles in accordance with all relevant DVSA rules and regulations. When this ATL MoT bay is recessed into the ground it leaves an aesthetically pleasing flush fit when not in use, however it can also be surface mounted depending on individual preference. The class 4 ATL scissor lift package is supplied to you with wireless play detectors and turntables as standard and also features an attractive checker plate finish that is not only visually appealing but also provides added protection against corrosion ensuring that your initial investment in your business provide great returns for many years to come. Class 4 ATL Scissor Lift Features. DVSA approved Class 4 ATL MOT Bay. 3 Year parts and labour warranty as standard (Optional 5 Year warranty Available). Integrated brake tester adaptor for class 1 & 2 vehicles. 1x European manufactured CE certified class 4 scissor lift. 1x Crypton UK manufactured combined emissions analyser. 1x Recessed wireless play detectors & remote control with integrated LED torch. 1x European manufactured brake tester. Maximum lifting capacity 4000 Kg, 4 Tonne. Lowering times 20 Seconds (approx). 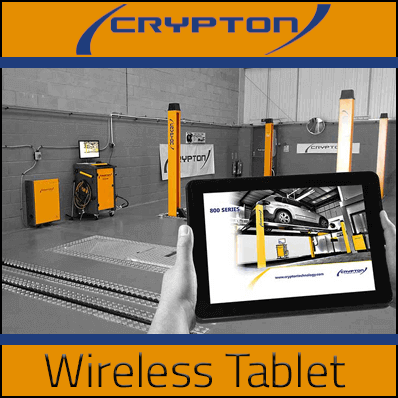 Designed to be compatible with all Crypton ATL MoT bay packages and combined emmisions analysers this innovative and ergonomic tablet has some amazing time saving features for complete user flexibility and ultra-efficient MoT testing. Crypton class 4 ATL scissor lift package quality and professionalism ingrained into every detail, to order yours contact a member of our sales team today on +44 (0)151 601 4945.